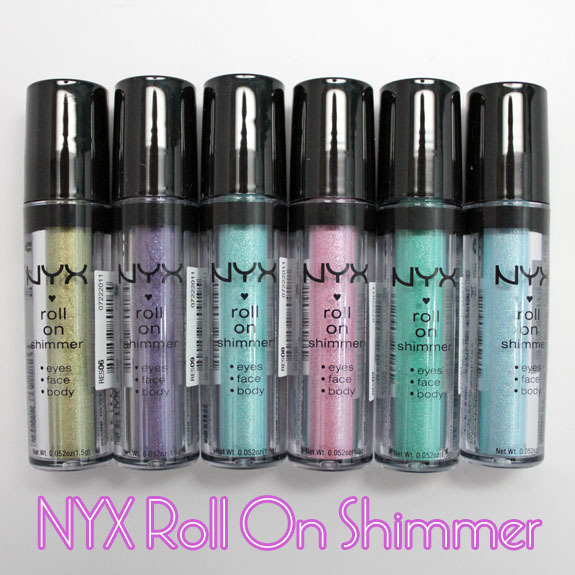 This spring NYX Roll On Shimmers are all about color for eyes, face and body. These loose powders come in a hard plastic tube with a roller applicator. There are sixteen colors in all, and all leave you with a whole lotta shimmery color! If using as an eyeshadow (which is the only way I would ever use them), you can use directly from the roller, however it can get a bit messy that way! I prefer to roll some onto my hand then use either my finger or a small brush to pat it on my eye. Using a shadow primer definitely helps it stick to your lid better. There will be fallout. Oh yes. There always is with loose powders, but it’s not that hard to clean up (or do it before all your other makeup). 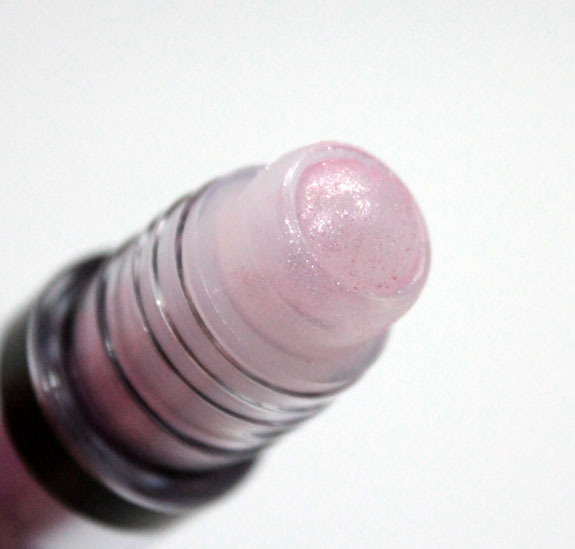 Pink is a medium cool toned pink with silver shimmer. Olive is a bright medium olive green with yellow shimmer. Purple is a deep grape purple with silver shimmer. Light Blue is a light aqua blue with silver shimmer. Sea Foam is a medium blue/green with silver shimmer. 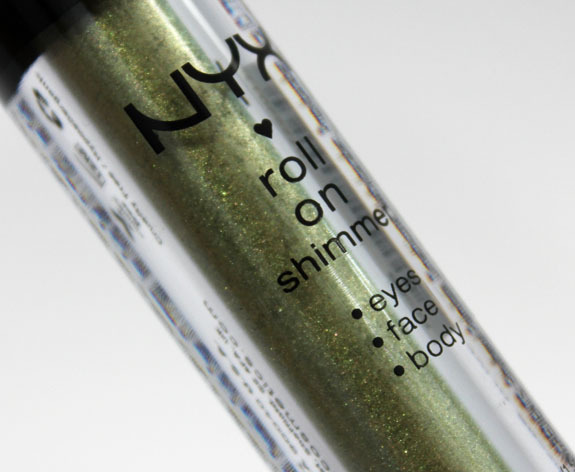 Green is a vivid green with silver shimmer. As mentioned above, there is fallout, but you get such good color payoff! They come out pretty easily from the container and you only need a little and it goes a long way. They are soft, not gritty and pretty easy to blend out to make less saturated. Or you can add more for even more color! Over a primer they last as long on me as a regular shadow. Pricing: $4.50 for 0.052 oz. Do you like loose powders like this? these are much more pigmented than I thought they would be! they look great, thanks for the swatches!! I REALLY like Olive. It looks like a color I can wear comfortably. Maybe one of these days I’ll conjure enough courage to try something that is not a pressed eyeshadow! Ditto, Sunny. Greeeeeeen forever. 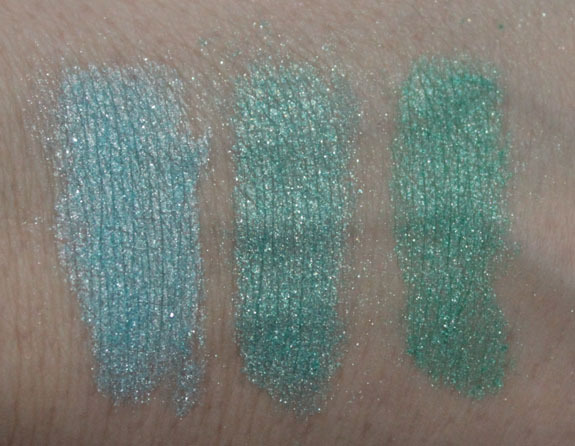 Also, I too was always leery of anything other than regular pressed shadow, but two things changed that : Illamasqua’s Liquid Metal creme shadows (omg amazing), and My Pretty Zombie loose shadows. The loose ones can be trickier/messier to apply, yes, but MPZ had so many unique colors I’d never seen in any other brand or format, I had to give them a try. Love! The texture on these looks super… definitely going to pick up Olive and Sea Foam! Thanks for the swatches! I find loose powders in roll-on contraptions annoying usually (they never apply product evenly &, the few that I had, i ended up taking apart) but these are so pretty, I think I’ll snag some despite the packaging! If its pretty I don’t mind a little fall out , myself. I will def have to pick some of these up . The colors are very pretty , and it seems like they wanted to do something that was easier to apply , not just powder in a jar. Thanks ! Very excited to try for myself! PtiteMeve´s last post…Thank You Katee!!! I’m really surprised at the pigmentation with these! I thought they would be more sheer with colored shimmer/glitter. And purple is gorgeous! These are fantastic! I hope there are more colors like gold, silver, and bronze for those of us who like the sparkle, but not the bright colors. I normally don’t like roll-on powders like this because they’re so sheer and they tend to crease on me after a few hours. 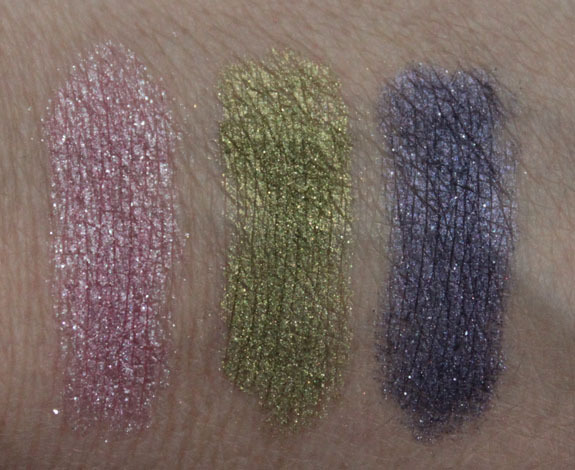 However, these look really pigmented and are beautiful colors. I might have to give them a try! Gorgeous colors. I’d never buy these. Don’t like a roll on to use for shadows. These looks like so much fun! I love glitter! Oh how cool. NYX is coming out with such interesting product. I would probably use that as body glitter to go with an outfit for an evening out bar/club hopping! 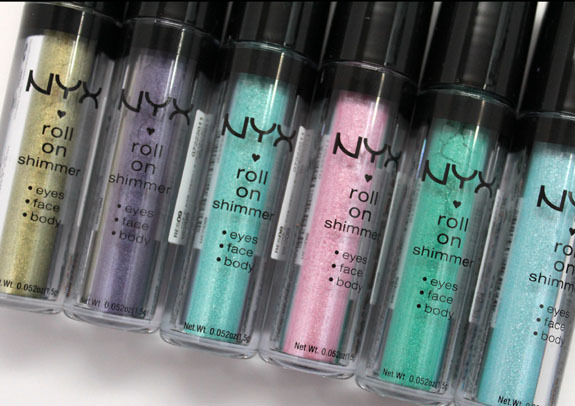 Awww, these remind me of Bonne Bell roll-on eyeshadows that I used in middle school! I like the Olive color. Wow, these really surprised me. I didn’t think they would have good colour pay off. I like all the colours you’ve swatched here- I might have to pick one or two up if I see them in stores. Especially the blue-green ones- so pretty! The roller applicator for eye shadows has never worked well for me. I like the concept, but the fallout and patchy application made it too frustrating. If I have to apply it to my hand first, I’d rather just have loose shadows in a jar or something. I like the looks of purple and seafoam. I’m really loving the look of Olive and Purple, will definitely check out the other colors. I received the purple from My Glam Bag. It looks pretty so I’m glad I’ll be able to try it. The 3 green/blue ones remind me of a mermaid – very pretty! Omg that looks so much easier to put on. Plus those colors are fabulous. I can’t wait for spring to get here already! Anyone else remember the Maybelline Roll-On eyeshades? I still have the pink one… I may have to indulge for nostalgia’s sake!